To many of us, Surf Art, is a myriad of images conjured. Some are dreamy, some are colorful, and others are gently textured. Serious art aficionados find Surf Art exciting and inviting all at the same time. Few will disagree that this medium is extremely creative and no one personifies the surf world thru their body of work quite like the legendary Artiste’, John Severson. Severson has always portrayed, filmed and painted the rich surfing lifestyle the way many of us see it in our imagination, on our notebooks in school, or thru the film and print media. His inspiration and thought process thru the years has tickled the fancy of many a surfer that continue to search for that fabled perfect wave or the ultimate session. His dream fulfilled became our lifestyle quest. In 2007 Pacific Northwest mat rider, Pete “Chiledub” D’Ewart, and his lovely wife Diane were on a surf trip to Maui. Being avid art collectors in their own right, they made a conscious effort to see if there was something of John Severson’s that they could find for their own collection. John’s oils, acrylics and watercolors are as compelling and original as any and highly sought after. Knowing that, Pete and Diane were interested in procuring a piece of John’s legendary artwork, whether it was something already completed, or to maybe commission an original piece if that should become the case. With that in mind the D’Ewart’s set out on a mission. To make a long story short, Pete and Diane lobbed into John’s studio for a look-see. They found a cornucopia of varied images and color at his studio. Here was a stunning array of a working surf art world and the ocean lifestyle surrounding it. And there big as life, was John, talking story and playing his Hawaiian guitar. The conversation in typical Pete fashion quickly turned to the Mat side with Pete explaining to Severson why he came to Maui: To Mat Surf! “The first thing I talk to any surfer about is the mat.” said D’Ewart with a smile. Most in the surf world know John Severson as the founder and brainchild of the original surfers bible, Surfer Magazine, a publication he started in 1960. What most of us don’t know is that he started his surf career on a Surf Mat in Southern California! The D’Ewart’s were impressed and left with John promising to paint something with a mat theme. Game on! Pete sent word thru the “coconut wireless” about the amazing paintings John had completed. Then, slowly, a few photos of the paintings emerged via email that blew us all away. From there the mat world began to realize what had happened and it was all good. Each of the three paintings would eventually show up in the Dale Solomonson tribute book, “Spirit Matters,” that was produced by the D’Ewarts in 2012. John was quoted in the book, just under his painting,The Right Mat Stuff: “I hope that Dale improves, and that Spirit will matter. All the best, and Aloha to Dale.” John Severson. In Volume 20 No. 7, July 1979 Surfer Magazine, I wrote an article called “The Shapers Perspective.” It was a long piece and I was lucky to talk to many of the top shapers in California during that era. Also in that issue, and featured on the cover was a painting of a dream wave for a cover story called “Surfer Art – A One Man Show by John Severson. He had long retired from the magazine by then and had left the mainland to raise a family in even more beauty, inspiration and idyllic surf conditions then could be found elsewhere, Hawaii. 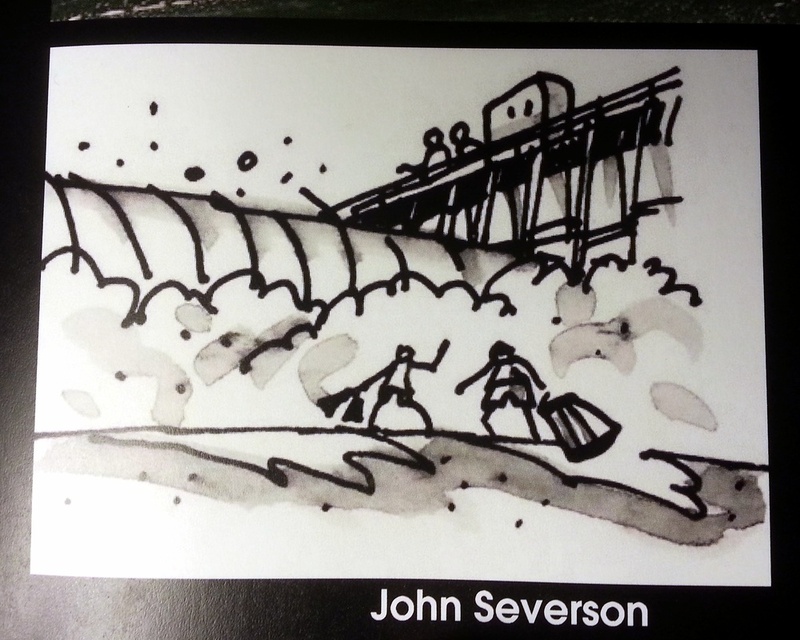 I was honored to have words in an issue of Surfer that featured John Severson on the cover. He was always an inspiration to me as a writer, photographer, filmmaker and of course, as an artist. His history is our history. It had become my history as well. Did I know John Severson personally? No, but I knew thru the grapevine that he had pretty much retired to the West end of Maui where he was surfing, painting and enjoying his life with his lovely wife, Louise. As I had lived in that particular area in the early 70’s as a surf bum, his legend was already larger than life to me. I was lucky to be on Maui a week or so before the D’Ewarts in 2007 and rode my mat on a solo session in front of John’s house one particular day (see Photo). The waves were firing. There, sitting contemplatively on his favorite red wooden chair on a secluded point for the entire ocean to see, was John Severson himself. I couldn’t help but notice him inspecting me as I paddled out. I rode a couple dozen waves that afternoon and at one point I waved to him and he waved back before getting up and going back into his house. I was stoked! Once Pete received the paintings I was even more stoked. John Severson started his incredible career as a painter, selling his first works, while finishing his Master’s Degree from Long Beach State College. It was in 1958 that John used his art, photography, and surfing passion together to create a surf movie series that instantly became popular. His films included Surf Safari, Surf Fever, Going My Wave, Big Wednesday and years later the iconic Pacific Vibrations. He originally started The Surfer, in 1960, as an annual magazine to backup his successful movies. He had been putting posters out with the movies but wanted something more substantial, like a program to go with each film. What morphed out in 1961 was a quarterly magazine that quickly became a Bimonthly in 1962. By 1964 he was on a roll and the last thing John imagined the magazine to be was “assembly line” or “Cookie Cutter-like.” It was a lifestyle like no other and it was John’s lifestyle as well as many others. John was at the forefront of a media awakening that discovered a strange but fascinating lifestyle called, Surfing. Always an Icon, he was a renaissance surf pioneer in many genres far ahead of his time, and he excelled at them all. Surfer, filmmaker, publisher, photographer, writer, artist, businessman, father and husband of many years, Severson set the standard in many ways. Not to mention an all around waterman in the purest sense of the word. As a surfer, John was known for riding big waves, and for his innovative performance style in big surf. He was a standout at huge Sunset Beach in the late 50’s. In 1961, he won the Peru International Surfing Championships and was a finalist in the U.S. and Hawaiian Championships. It was Severson who had the forethought to bring the insulated and intriguing world of waves and beach culture to the world at large. He mentored, surfed with, and worked alongside some of the greatest names in surfing. To name but a few the list includes Leroy Grannis, Rick Griffin, Ron Stoner, Drew Kampion, John Van Hammersveld, Bruce Brown, Bev Morgan, Ron Perrott, Roy Porello and a young promising upstart named, Arthur Jennings Brewer. To top it off before he made his infamous “Exile off the California Main Street” to Maui, John lived at San Clemente’s exclusive surf spot, Cottons Point. His house was right next door to Mr. and Mrs. Richard Millhouse Nixon. It was widely rumored that the Severson’s dogs joyfully tromped the Nixon’s Flower Garden, much to the chagrin and watchful eye of the Secret Service. It’s no wonder John moved to the Islands. In 2011 John Severson was given the prestigious Lifetime Achievement award at the Surfer Poll Awards. Has he stopped yet? No! He still surfs, paints, plays guitar and enjoys life thoroughly. Earlier this year I made a conscious effort to contact John to ask him a few questions about his mat artwork that Pete and Diane had commissioned. He was kind enough to accommodate me and allow me to share his words and images. I explained that there was really not much historical perspective on mats from the 40’s and 50’s, when mats gained popularity on the busier summer beaches around the world. And, that there was almost zero first hand knowledge. I quizzed John, “If you remember what type of mats that you rode? Did they have ropes around them? “Where did you get those mats? How old were you when you first rode a mat? I continued, “Did riding mats then influence the way you approached surfing on hardboards? Nowadays mats are ridden with very low inflations. Did you blow up your mats as much as possible? Did you ride them laying down or standing up? Of course what started all this were the paintings John produced for Pete and Diane. I had to ask about these three amazing images. From the films he has produced to his incredible posters and artwork, the countless waves ridden, all the surf sessions, Ranch Trips, Hawaii, and his Surfer Magazine years right up to the three mat paintings, John Severson has had quite a surf life! His art is original, creative and thought provoking all at the same time. There is no doubt that this incredible body of work will stand the test of time.